For real: Zombies scare the crap out of me. I haven't figured out why exactly. I mean the logical part of me knows that it could never happen, but reading a zombie book or watching a zombie movie never fails to give me nightmares. 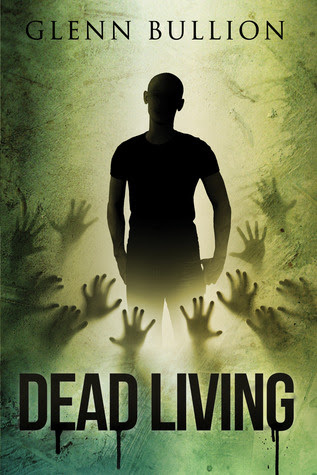 Dead Living was no exception. At first this book totally terrified me. The beginning chapters are a little gory and super fast-paced. But once things settled down, I got really into it. The characters in this book make it what it is. Aaron has been living alone in Baltimore among hoards of the dead, but since they don't seem to notice him, he finds it peaceful. Then he meets Sam and she takes him to the school compound where she's been living. Along the way they form a genuine friendship that I found really sweet. I thought it was a cool and unique twist to have a character who was immune to the zombies. There's so much that Aaron can do that no one else can! I honestly wish he would've just stayed at the school for the rest of the book, but there was a journey that needed to be made. One of the saddest parts of this book was the reality that in times of crisis a lot of people become evil. Of course you have people that are willing to risk their lives to help you, but you have those that will kill you before the zombies can. I hate thinking of humanity like that, but it's the truth. It was interesting to see how the younger generation in this book didn't know about geography, terrorists, technology, or history much at all. They were just trying to survive in a dangerous world and that's all that mattered. It was the things that we use everyday that they had no clue about. That was a cool thing to read about. The only thing I didn't love about this book was that we got to hear everyone's thoughts throughout the whole book. I personally like stories better when you don't know what every character is thinking and just hear from one or two's POVs. Overall: A thrilling zombie book with a unique twist that will have you up late. I completely recommend for anyone who likes zombie books as this one has more going on it than your average one. The characters and their stories are really the basis of the book, but don't get me wrong, it is still nightmare inducing!! I'm 3/4 of my way through this book and i have to say it is pretty good so far. I really like Aaron. That's a new twist! A boy who is immune to the zombies and find living among them peaceful. I'm putting this on my to-read list!